Pricing is highly critical and an in-depth topic. Can such a short book fulfill your needs? We will see. Neil Davidson is also famous for hosting Business of Software. Know your market segment: People work with relatives. If your competitor’s products cost between $10 and $20, you have a hard time sell yours for $2000. The first thing is to learn about your market segment. How high are competitor’s prices and why are they what they are. Learn about your customers. For example, software that cost less than $10 will be easily bought by nearly anybody. If your software costs more than $50 some personal customers may get nervous. If you product costs more than $1000 your customer probably needs to talk to his superior. Even $1, $999 vs. $1000 can make a huge difference! Ideally, you should know about this by customer development. Think about presentation: Pricing is not just about setting a price. It’s also about product presentation, e.g. bundling. Do you sell other software? Which alternatives are there? Maybe you could sell with an complementary product? There are lots of different possibilities. Generally, selling just one product will produce a higher price. Test, Test, Test: The most important thing, like expected, is testing your pricing. The best way to do so is by features. Take a look at software from 37signals or Microsoft. They got different product packages. For small and large businesses or personal users. You should avoid to charge different prices for the same product. This can really annoy users. One idea is that you sell your product for $x but display $x resp. $(x+y) as price. If enough users were willing to buy for $(x+y) you can increase your price and use this event as a nice marketing tool. 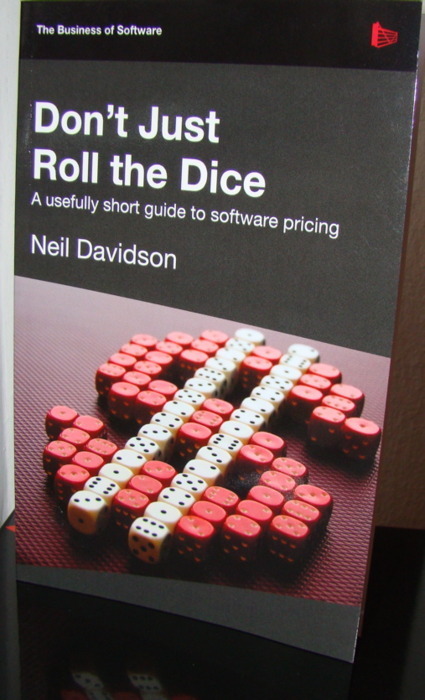 Firstly, you can read Don’t Just Roll the Dice for free! I liked the book, however it is just 80 pages or so. I think it got some nice ideas and is more to get a overview over the topic than really learning about it. You will find lots of articles on pricing on sites like Hacker News. In conclusion, great book for learning the basics but later you should look for other resources.